Dan Elwell is the Acting Administrator of the Federal Aviation Administration (FAA). 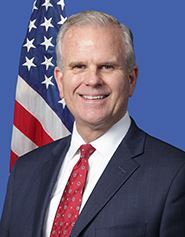 Prior to serving as Acting Administrator, Mr. Elwell was the Deputy Administrator of the FAA. President Trump announced the appointment of Mr. Elwell as the Deputy Administrator in June 2017 and he was sworn in to office on June 26, 2017. Prior to A4A, Elwell was Vice President of the Aerospace Industries Association (AIA) from 2008-2013. In this role, Elwell represented civil aerospace manufacturers and led policy development and advocacy for the civil aerospace manufacturing interests of more than 300 AIA member companies.